Being an entrepreneur is a pretty taxing lifestyle filled with long hours and stress. With the holiday season quickly approaching, now is a great time to pick up some health habits for managing the stress of the holiday season. 1. Don’t Be So Hard on Yourself. First things first, don’t beat yourself up if you can’t (or don’t have the time to) create a perfect holiday set-up for your family. It’s the quality time with your family (not perfection) that matters most. Plus, those perfect holiday set-ups can be found only in magazines, on Pinterest, and on the Food Network. But, here is the kicker — they don’t show you that there is a team of people working behind the scenes to create them. 2. Know Your Limits. 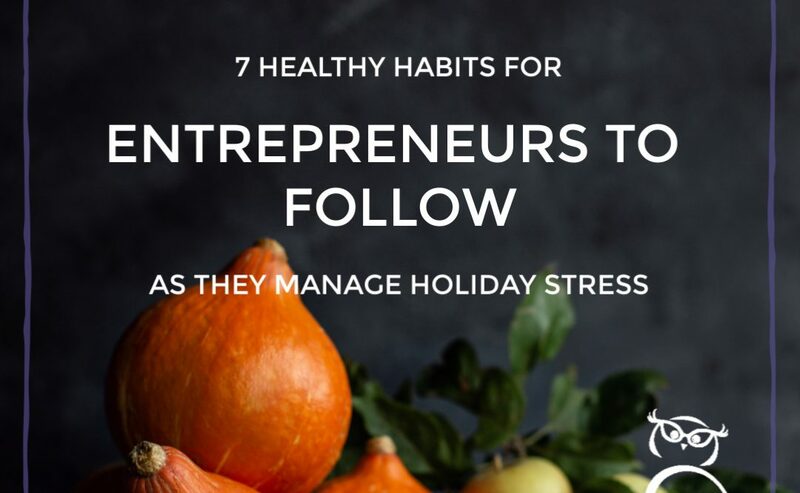 As tempting as it may be to work on your business AND participate in all of the holiday activities, you simply don’t have enough hours in the day. So, prioritize what is most important to you and only take care of those projects. Then, practice saying “No” to those project requests that are not a priority to you. 3. Practice Self Care. Exercise regularly. Enjoy a Healthy Diet (but add some holiday treats of course). Take some time off work. Keep a Gratitude Journal. Get Some Rest. Got to the Spa. And spend some time Loving and Laughing with Your Family and Friends. 4. Ban Your Devices from Your Bedroom. Did you know that your devices emit a short-wavelength blue light that could impact your ability to fall asleep? Well, it does. And, a lack of sleep definitely affects your stress level. So, before you head to bed, charge your devices in a room other than your bedroom. Then, go to bed! 5. Communicate Your Time Off in Advance. Before the holidays begin, give your clients and customers the heads up about your holiday office hours. You should share this information via e-mail, social media, and on your web site. Also, write and schedule your “out of office” message on your e-mail and phone. 6. Create and Follow a Holiday Budget. People tend to “over spend” during the holidays, which result in financial stress in the near year. Set a holiday budget for your business and for your personal life, then plan accordingly. Then stick with your budgets! 7. Focus on What You Can Control. By focusing on what you can’t control, you zap your energy and take away your attention from what’s important. And, by focusing on what you can control, you lift your spirit and minimize your holiday stress — some examples of what you can control include your gratitude, your emotions, your reaction, your diet, your kindness and your judgement.